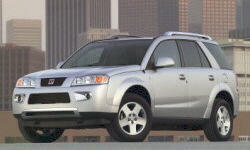 Saturn VUE Pros and Cons | Page 1 of 4 | Why Not This Car? What drives people to buy (or not buy) a certain car? 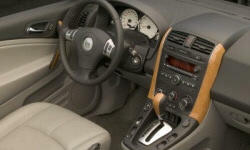 TrueDelta's members share Saturn VUE pros and cons based on their real-world driving experiences. Loved the exterior and the look. Have owned this 06 Vue 3.5L V6 AWD since 07, and have enjoyed it ever since. Like the clean lines and size of the vehicle, especially vents along side. When I bought this vehicle new, Saturn had a great reputation - one I personally experienced growing up in a family of Saturns. I liked the boxy shape, it had a different profile than other mid size SUVs and had the plastic sides that after 5 years still have no door dings. It is cheap, the discount was the reason my friend bought the truck. I owned a 2005 Vue, I was hit from behind by a driver who was going 60mph, I was stationary. I was pushed into the car in front of me and walked away with minor aches and pains. My Vue kept me safe and was a total loss. The color black was first choice for spouse. The book says 26/33 for mileage. Wife gets significantly less in town. I can get 24 to 25. On 1000 mile trip, I got 33, when car was less than 1 year old. Wife gets 20 in town, with short stop and go drive to work. The electric assist is seemless and practical to give an already efficient 4 cyl a big boost when needed. Very powerful, fast acceleration if needed, responsive. I moved up from a Plymouth Voyager and wanted a small SUV. The VUE felt right, afforded me a clear view front, side and back. Mine is completely loaded! Power everything, air conditioning, satellite radio, CD player, leather interior, and other things that are not standard in compact SUVs. Excellent fuel economy for an SUV.